We had such a good time painting winter critters this month! I love to see students grow and learn! It makes me so happy to hear that something I shared was worth coming to class! I have started putting together a fun Spring Class, so watch for news on that! Last weekend was the Teeny, Tiny Summer Watercolor Series Retreat. I was blown away by the amount of talent in class! We started off the morning talking about paint, brushes and paper. We then moved to sketching! Talk about some serious skills, wow! After break for lunch we spent the rest of the afternoon painting. I am proud to say that everyone went home with finished projects to be proud of!! I am going to enjoy the rest of the summer, but I already have a plan in works for the fall class. I am really excited about it! In my mind it will be grand, now I just have to get it down on paper with paint! Here are few shots from class! Shannon had a whole beach theme going to decorate the nursery for her new arival! Here is a look at the supply bundle that will come with your Teeny Tiny Summer Watercolor Series Class. So many fun things for you to create with! I would love to have you! Check the Retreat tab for cost and details. 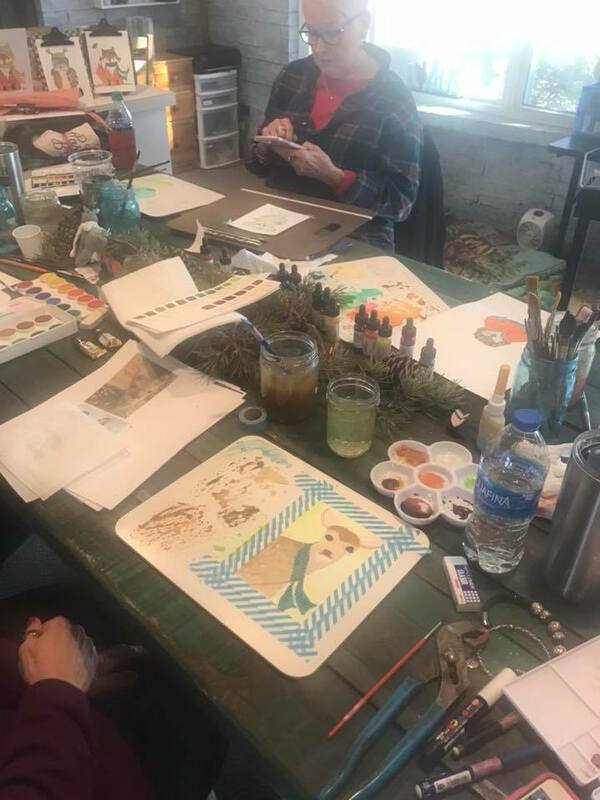 I have been planning out all the projects for my newest Watercolor Retreat, and we are going to have so much fun! I plan on teaching one of my favorite ways to use watercolors---on gesso! This technique will challenge you with it's uneven surface, but the rewards are amazing! Please hit the retreat tab up top and check out all the details. Space is limited to 5 so don't delay! Join the fun on July 8th! Today Trooper and I remember our fallen heros. They are the reasons we are free! This is a project for my upcoming Teeny Tiny Watercolor Class in July, Please check the Retreat tab for all the details. I would love for you to come and make a little watercolor tag book with me. 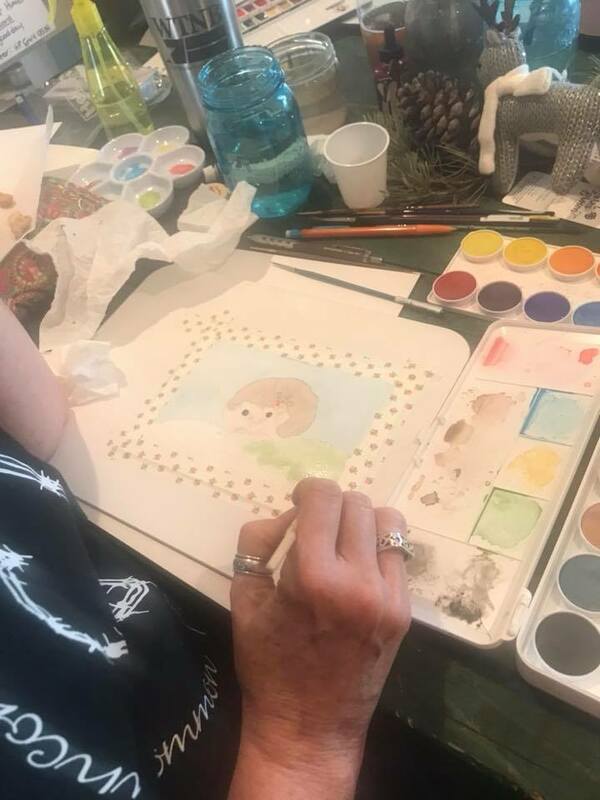 I am so excited about my summer watercolor retreat! I just uploaded all of the details under the retreat tab! Please go read all about it! I have so many Teeny Tiny Watercolor ideas, and you are going to love making these little projects! Make sure you are following me on Instagram and Facebook so that you get a few extra sneak peeks of whats to come! Burrrr..... lets think about warmer days! It is cold here today! The temp is 18 and feels like 0. Right now I am hanging out by the fire watching Christmas movies. I have spent the last few weeks planning out my next watercolor retreats. As I started brain storming on projects one thing that came to mind for the season of love and spring was love letters. My grandmother keep lots of letters wrapped up in twine and ribbon. Keeping in line with my vintage music paper series I came up with a heart that looks like stain glass. I would love to have you join me- please check out the Retreats tab at the top of the page- all of the dates, cost and info is there. I keep meaning to get a blog post up but things just kept happening to prevent it. First I went out of town for a girls weekend and then I came back with a cold. Uggh I am so tired of blowing my nose! I also wanted to share my 2 pieces of art in the Fall Watercolor Society Show. I didn't win anything, but I was BRAVE enough to enter and that's the most important thing. Next time I wont be a first timer and I will know what to exspect! I am lucky enough to live in a city with quite a few artists, and the famous kind! Here in LBK we have a Watercolor Society. I joined at the end of the season last year, and this in my 1st full year as a member. 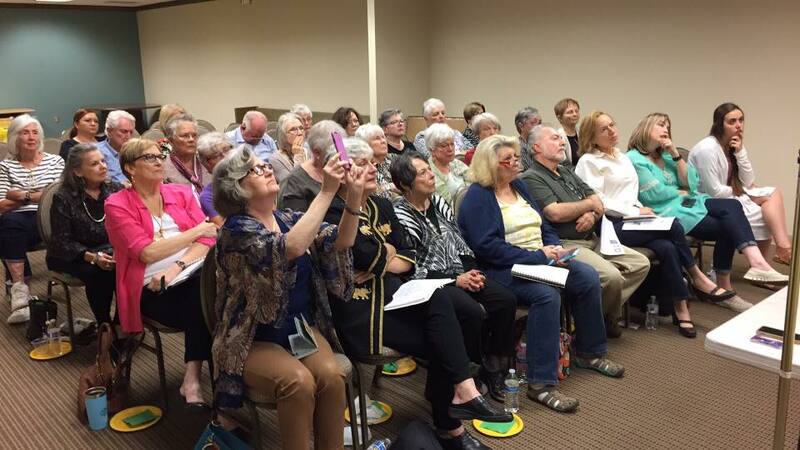 We have monthly meetings and presenters. Yesterdays meeting was amazing- I learned so much. The presenter was Peggi Habets. Peggi will also be the judge for the Fall Art Show. Here are a few pictures from yesterday as well as my 1st ever painting entered in an art show! Here is a little fall wreath I painted last night while sipping a glass of wine and hanging out with my boys! Here is a quick shot of the before. I used the bottom of my glass to pencil in a circle. I still have a few spots left in my Fall Retreats. I promise you wont be disappointed! Click up top and read all about what we will be doing! Then send me a message and join! These little watercolors (this one is about 4"x4") are some of my favorites ways to get a little sketching and painting done during the week. I mostly find the time to paint larger pieces on the weekends, but doing tiny studies like this one helps me with "itching to paint" feeling mid week! I try to keep them small and simple. Seasonal paintings are my favorites and of course the colors of fall are always so beautiful! Meet you back here next week for another rounder of watercolor Wednesday!